If you don’t have plans this Sunday evening, you might want to snag tickets to the first ever Food Truck Takeover. How often do a bunch of award-winning chefs get together to cook whatever they feel like in a food truck? Two of the chefs, Curtis Shaver and Tucker Yoder, were named C-VILLE Rising Stars for their potential to be join Charlottesville’s next generation of Mt. Rushmore Chefs. The other two, Caleb Shriver and Phillip Perrow, were nominees for Food & Wine Magazine’s People’s Best New Chef in the Mid-Atlantic. 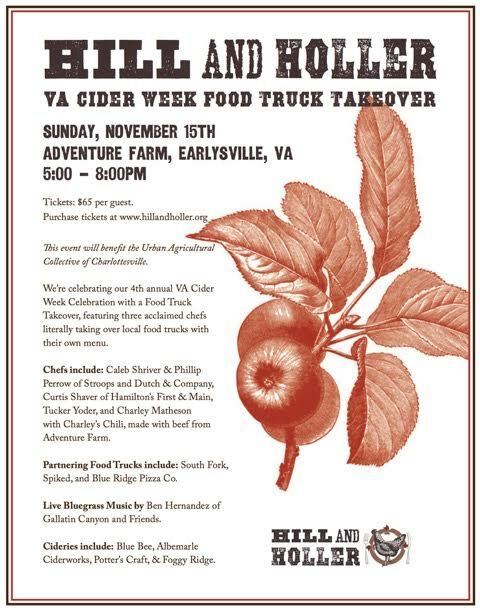 They will all be taking over food trucks South Fork, Spiked, and Blue Ridge Pizza Co.. And, as part of Cider Week, great cider will be on hand to wash it all down, including Blue Bee, Albemarle Ciderworks, Potter’s Craft, and Foggy Ridge. Among the many great dishes, Yoder plans Fried Braised Fall Squash, with turnip and apple chow-chow, smoked cornbread, and buttermilk dressing. And, for dessert, an Apple Hoe Cake with cider bourbon syrup. Top it all off with bluegrass by Ben Hernandez, and you’ve got a pretty solid fall Sunday evening. $65 gets you all the food and drink you want, and, best of all, proceeds benefit the Urban Agriculture Collective of Charlottesville. Sunday from 5-8pm at Adventure Farm. Buy tickets here.